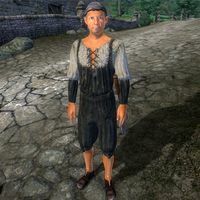 Aelwin Merowald is a Breton commoner and fisherman who lives in a farmhouse in Weye across the street from the Wawnet Inn. His last encounter with a slaughterfish left him injured and too weak to collect the last load of scales he was planning to sell to an alchemist for a final boost to his retirement fund. He will need your help to finish the job. Aelwin definitely believes in the principle of "early to bed, early to rise". He sleeps in his house from 8pm until 4am and then breakfasts for two hours in the same place. Regardless of the weather, he then wanders around Weye from 6am until 6pm and then eats for another two hours until 8pm before going back to bed. The exception to this schedule is during the Light the Dragonfires quest, when all residents of the Imperial City are under martial law and confined to their houses. His clothing is suitable for a man of his profession: a pair of fishing waders and rough leather shoes. He is armed with an iron war axe. He carries a small amount of gold and, if you have completed the quest, the key to the chest and the twelve slaughterfish scales. When you meet him for the first time he will give you some insight on his current situation - make sure not to laugh at him afterwards: "You know, stranger, there comes a time in every man's life when he has to admit that he's lost the fight. Well, I've fought and I've lost. Who did I lose to? Who is my great enemy? Well, don't laugh... it's a bunch of damn fish." If you choose to laugh in his face, he will get downright angry: "Bah! See, I knew you'd laugh. Some big hero you are. You're all the same. Nothing to do but laugh at an old man and his troubles." After this speech his disposition will drop 60 points and he will just say: "Come back to laugh at the pathetic old man, have we? To the pit with you! Leave me alone." If you instead choose to show some interest he will say: "Go on and lau... Wait. Help? Oh. Well, then... I'm a fisherman. Or at least, I was. Until one of those slaughterfish damn near took my leg off. I was collecting their scales, see. I had a contract with this young alchemist. You wouldn't believe what he was paying for those scales! Then last month, one of the bastards got ahold of my leg. Took me right out of the business. But this alchemist, he needs the scales right away." Then you can choose to take further interest or leave. If you choose "I have to go..." he will respond by saying, "Fine then, I will find someone else. Someone who isn't too busy to help a desperate old man." If you choose "About those scales..." he will say, "The alchemist was paying so much for the scales that I'm close to having enough saved so that I can retire. But now, I can't get out there to the lake -- not with this leg. I only needed twelve more scales! Can you believe it? I was so close! I've picked up a few things in my travels. If you head out there and bring me back the twelve scales that I need, I can make it worth your time. Help an old fisherman out, won't you?" After you have brought him the scales, he will be much happier: "I'm looking forward to my retirement -- long days in the stable with the horses, long mornings in bed, and best of all: no more fish." When you ask him about his savings, he will give you all the information you need to know: "Well... I'll tell you a secret. I took some of the money I saved and paid a mage to lock the rest of it away in a box inside my house. Nothin' can open it except for this key right here. And there ain't no way anyone is gettin' this key while I'm still breathing. Yessir, I worked too hard to collect that money. I'm not about to let anyone steal it from me." Aelwin has extra dialogue that never appears in game. The line "Still staying away from my fishing spots? I may be retired but they're still mine, you understand?" will only be spoken if stage 110 is set on the Go Fish quest. That stage seems to be related to the amulet version of the Jewel of the Rumare, but no script activates it. Esta página foi modificada pela última vez à(s) 18h44min de 6 de outubro de 2014.